Pickup from Jaipur Airport / Railway Station / Bus Stand by placard carrying driver and transfer to Hotel Umaid Bhawan or Umaid Mahal hotel. 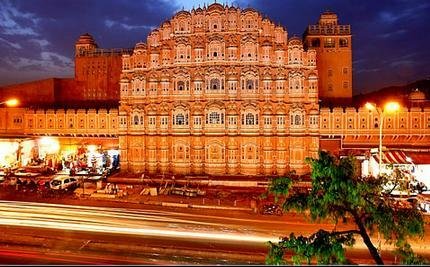 Later visit to the fabled Pink City, the old Jaipur.Drive through the Johari Bazaar to the Hawa Mahal (Palace of Winds). Visit the various museums inside the City Palace and the ancient observatory, Jantar Mantar.Pay a visit to the Govind Deoji Temple, housing the patron deity of Jaipur. Evening free for your own activates like shopping, etc. Evening visit Chokhi Dhani for Rajasthani traditional dinner with dance and music. Overnight stay at hotel. Depart for Ranthambore after breakfast. Visit Elephant Sculpture on the way. Check-in at hotel in Ranthambore. After lunch visit to Ranthambore National Park. (Entrance fee to National Park are extra). Morning visit to National Park – Project Tiger. After breakfast sightseeing of Ranthambore Fort is optional (If guest agrees to reach by late evening at Bharatpur) Depart for Bharatpur.If time permits, a brief visit to the Keoladeo Ghana, Bird Sanctuary. Check- in at Hotel in Bharatpur. Morning visit to Keoladeo Ghana, Bird sanctuary. Depart for Jaipur after breakfast. Visit to Abhaneri Step Wells on the way. Overnight stay at hotel in Jaipur. On the last day of the trip, visit the magnificent Amber Palace. See the Largest Cannon on Wheels in the World, and old cannon foundry at Jaigarh. Visit to the Kanak Vrindavan Temple in the valley of flowers. Drop at Airport / Railway Station / Bus Stand in the evening. 4 Nights in the above mentioned / similar hotels. All Meals are included at Ranthambore hotel. Rajasthani dinner at ethnic village Chokki Dhani at Jaipur. Bharatpur Guide & Entrance Bird Sanctuary. If you have not decided yet or wants to customize tour itinerary or hotels listed above in "Wild Safari Rajasthan Tour Package for 5 Days Package", then we can change the travel itinerary and make a personalized, tailor-made holiday package, especially for you. We can modify this travel package as per your itinerary, budget, duration and the tourist places you would like to visit, including transportation and airfare should be included or not. Please fill the form below to contact us.